A rather special exhibition opened in Fitzrovia's Coningsby Gallery yesterday. London's Underworld Unearthed: The Secret Life Of The Rookery charts the grim history of St Giles, one of the most impoverished neighbourhoods of the 18th and 19th centuries. The exhibition is unique in bringing together recent archaeology, original art work, literary quotations, well-researched historical insights and a touch of psychogeography. Visitors get a chance to see artefacts unearthed during construction of Central St Giles, that contentious orange, green and yellow complex behind Centrepoint. Alongside are tales of squalor from the rookeries, where every fourth property was a gin shop. To borrow a line from a great man, you will never find a more a wretched hive of scum and villainy. 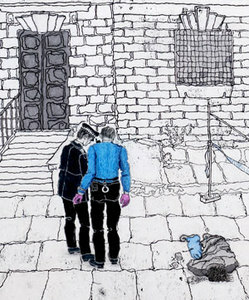 The exhibition is brought to life by a series of drawings by artist Jane Palm-Gold. The artist also provided much of the historical research for the show, spending six years in archives and libraries. Shown alongside the potsherds and clay pipes excavated by Museum of London Archaeology, this is a splendid, rounded exhibition of 18th Century slum life. One not to be missed by anyone interested in London's social history. London's Underworld Unearthed: The Secret Life Of The Rookery is at Coningsby Gallery, 30 Tottenham Street, until 3 June. Entrance is free. Free talks take place in the gallery on 21, 22 and 28 May, all at 3pm.